I poached a few charts off of ZH that I found quite interesting. These paired with the fact that my next door neighbor just bragged to me about how he is killing it in the markets make me a bit nervous about the near future. So, what happens when deflation returns to the world despite the Fed's best efforts to keep things going? 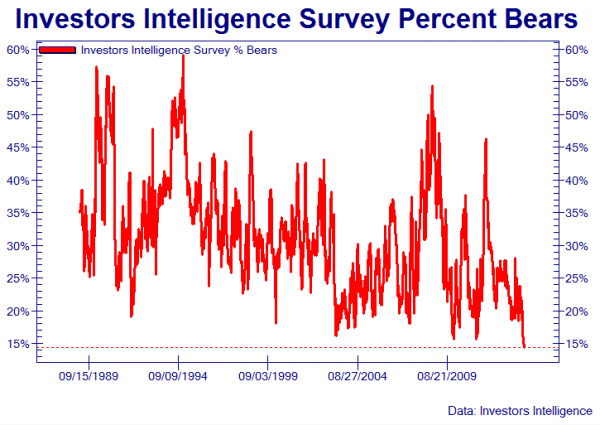 What happens when some of the record proportion of Bulls start to see the writing on the wall? I for one do not want to get caught holding the bag when reality sets in and these charts begin to revert back to normal levels. May I Borrow Your Pin? I found the above chart very interesting and thought I would share it here. First, let me explain what we are looking at. The blue series (left scale) is the Wilshire Real Estate Investment Trust (REIT) Total Market Index, which measures the value of publicly traded U.S. REITs. Before the Great Recession (shaded area) the REIT index rose as high as 6,174 in December 2006 before falling to a level of 1,687 in early 2009. This is a drop of 73 percent! Now how much have we recovered since these lows? Well, when I pulled this data (10/30/13) we were at 6,838. In percentage terms this in a gain of 305 percent. In terms of recovering ground from before the recession we are about 11 percent above the previous peak. These are staggering statistics. Before seeing this data I would never have believed that we were back to, and above, the real estate values that we were seeing in 2006 and 2007. Why is this happening? Enter the green series on the chart! The green series (right scale) measures Mortgage-Backed Securities held by the U.S. Federal Reserve. There is a very significant statistical relationship between these two series. You can clearly see that the Fed had no MBS portfolio before 2009 and that in March of 2009 the line jumps dramatically and increases to over $1.3 Trillion in a matter of five years. We know that the Fed has been purchasing $85 billion worth of MBS per month for some time now. Is it a coincidence that the REIT market bottomed precisely when the Fed began their unprecedented program of purchasing mortgage backed assets? Maybe. 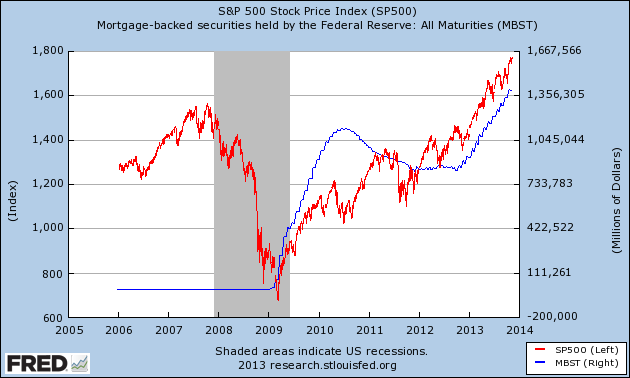 This graph shows the same Fed MBS portfolio (now in blue) along with the S&P 500 index in red on the left scale. The same correlation exists and the same inflection point in 2009. My question is, what happens when the Fed begins to tighten monetary policy? 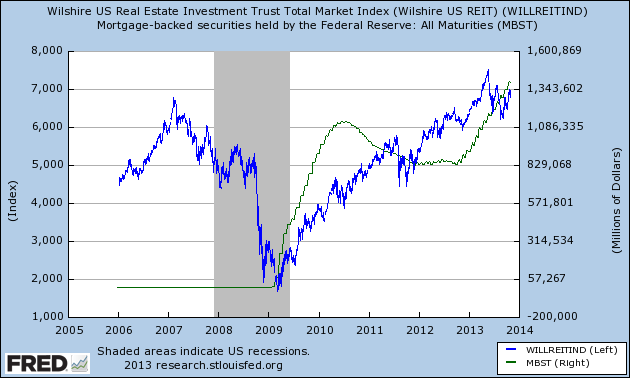 Will this eventual tightening take the wind out of the sails of the REIT and equity markets? The conclusion is foregone. So, the question may be better stated as, how severe will the correction be when the Fed tightens monetary policy? Everyone agrees that 2006 and 2007 were perfect examples of asset bubbles that needed to burst in order to restore some sanity to the markets. Prices had gone up too far in a short time. Well what about now? Currently there is no consensus about whether we are in a bubble. We have been hearing many warnings from economists and asset managers for several weeks now but there is an equal and opposite reaction from the other side saying that this is only the beginning of a new era of prosperity and that asset prices look healthy. If we were in a bubble in 2006, then what are we in right now?